Sean Quigley inspired Fermanagh to a 0-14 to 0-12 win over Sligo in the Division Three game at Markievicz Park. Quigley scored three of his seven points in the first half with Fermanagh leading 0-8 to 0-6 at the break. Points from Adrian Marren and Mark Breheny kept Sligo in touch but the Erne side sealed victory with two late Conall Jones scores. 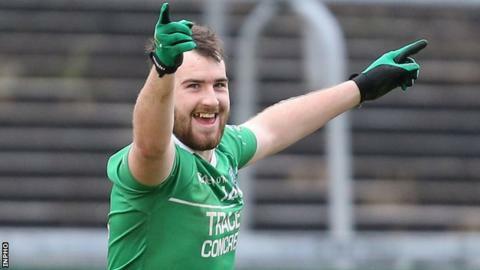 Barry Mulrone and Ryan Jones also chipped in with two points as Fermanagh made it two straight league victories. Fermanagh were aiming to build on last weekend's win over Louth and they scored the opening two points thanks to Quigley and Mulrone. Breheny pulled one back and Quigley restored the two-point advantage before Sligo levelled through scores from David Kelly and Breheny. It was level at 0-5 at 0-5 but Mulrone, Ruairi Corrigan and Quigley fired over for the Ulstermen only for Sligo, who lost Neil Ewing to a black card, to have the final say in the first half with Niall Murphy's point. Fermanagh substitute Tomas Corrigan was also black-carded, less than 30 seconds after coming on, early in the second half. The visitors opened up a four-point gap with Quigley slotting over four times in a decisive period of the game. Jones added the late insurance points to leave Fermanagh top of the Division Three standings after two matches.